Oysters Rockefeller scream elegance, celebration, holiday, sophistication. Do you know that they’re very easy to make? Our Oysters Rockefeller Italian Style are an easy, tasteful adaptation of that rich appetizer first served in New Orleans. 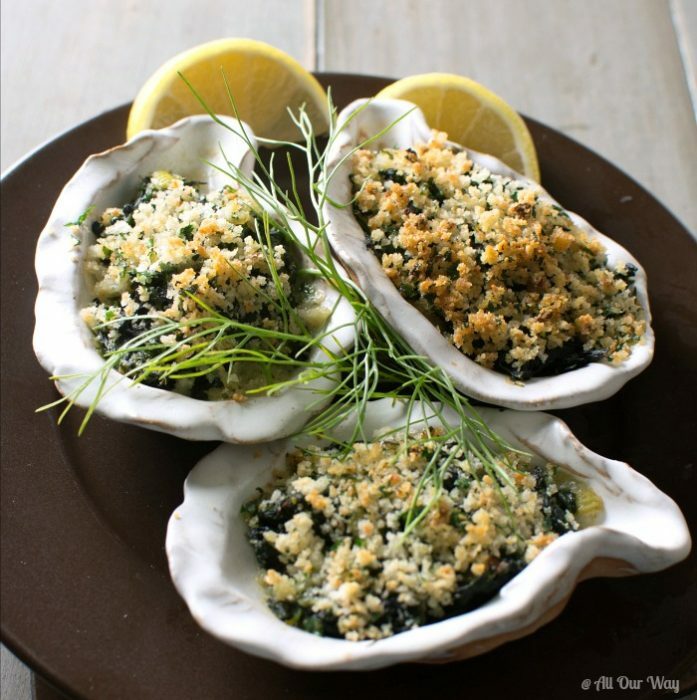 Picture succulent oysters covered in a green, seasoned spinach blankets then topped with crunchy garlicky golden breadcrumbs. What a flavor sensation! The year is 1899, and there’s a shortage of French snails. Jules Alciatore, the son of the founder of New Orleans restaurant Antoine’s, is in a pickle. He has to come up with a substitute for their snail appetizer. Their snails are their most popular dish with the customers. What can he do? He thinks about this a while and then an idea pops up. What do they find plentiful around the Louisiana coast? Oysters, and lots of oyster beds. Jules figures why not substitute oysters on the appetizer menu? The idea excites him. Using oysters instead of snails is a plus-plus for Antoine’s. They won’t have a shortage of oysters, and they won’t have to ship them from France. It doesn’t take Jules long to creates a recipe. The sauce in the appetizer is so rich that he decides to name it Oysters Rockefeller, after John D. Rockefeller, the richest American at the time. The Oysters Rockefeller becomes so popular that many of the New Orleans restaurants try to duplicate the appetizer. To this day, Antoine’s chefs still serve the traditional dish although no other restaurant successfully replicated the original. The first time I sample Oysters Rockefeller is at a company dinner. We’re having dinner at the only continental restaurant in our small town. A lot of the dishes on the menu are ones that I’ve never encountered. One of Honey’s associates, Phil, sees me studying the appetizers and he suggests I order the Oysters Rockefeller appetizer. I love trying new dishes, so I order the oyster appetizer. When the waiter serves the Oysters Rockefeller on the half-shell, I can’t see the mollusks. 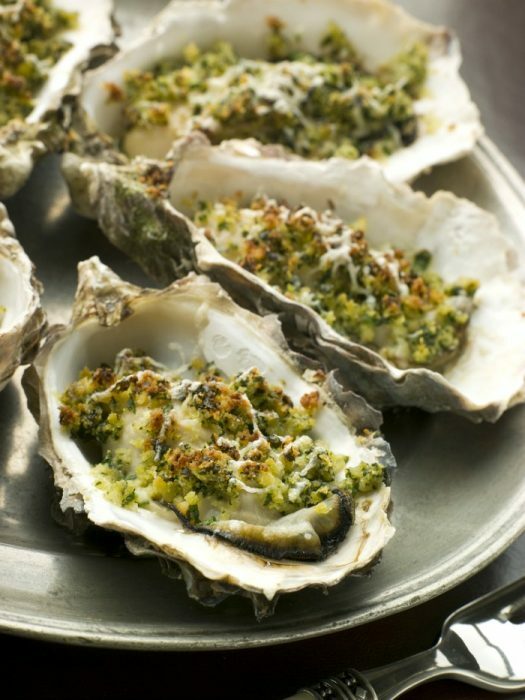 The oysters are covered with a green overlay and on top of that are golden bread crumbs. I dip my seafood fork into the appetizer and take a taste. Oh. My. Heavens. It tastes so good!! The oyster is juicy but with some chew. I discern spinach but underneath there are multiple layers of flavor. Garlic. Onion. Then I recognize the one that was teasing my taste buds. It’s anise. I’m captivated by the taste and texture of the Oysters Rockefeller that the rest of the meal is just a blur. When I get home, I know I’m going to try to duplicate the Oysters Rockefeller. 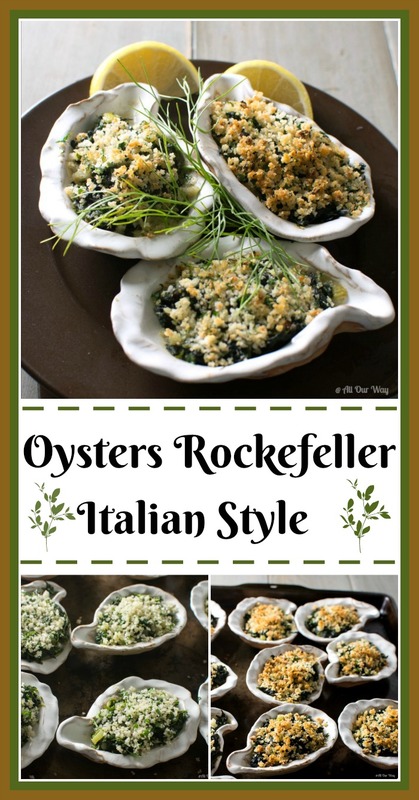 Today, I still make Oysters Rockefeller as I did all those years ago. The only difference now is that my oyster shells crumbled after baking dozens and dozens of appetizers. My solution was to buy ceramic shells that would withstand the oven’s heat. The recipe is very simple. You need to saute minced garlic in butter. Half the garlicky butter will go into the bread crumb topping, and the other half will go into the spinach mixture. If you have oysters on the half shell, you will need rock salt. The rock salt stabilizes the uneven oyster shells. My ceramic shells have a flat bottom that makes them steady. 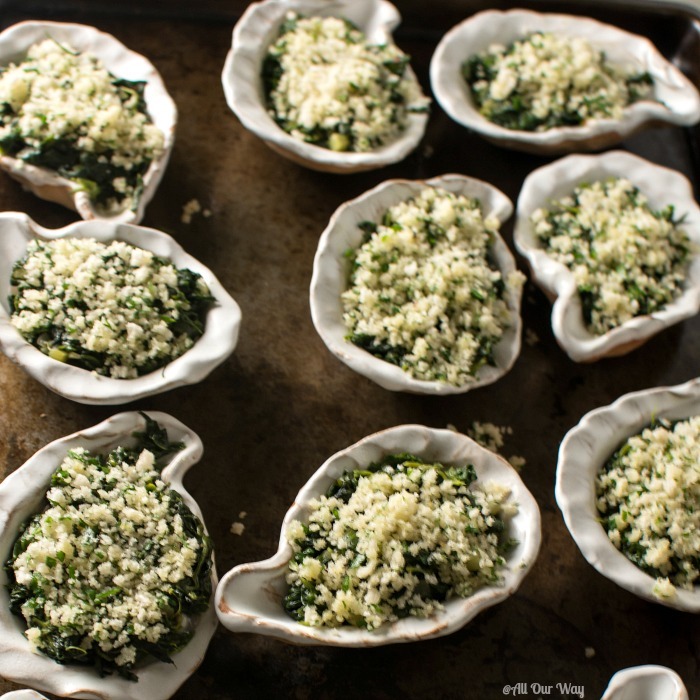 I spray the shells with oil spray, place an oyster on the shell, cover the oyster with the spinach mixture, then sprinkle the breadcrumbs on top of the green layer. 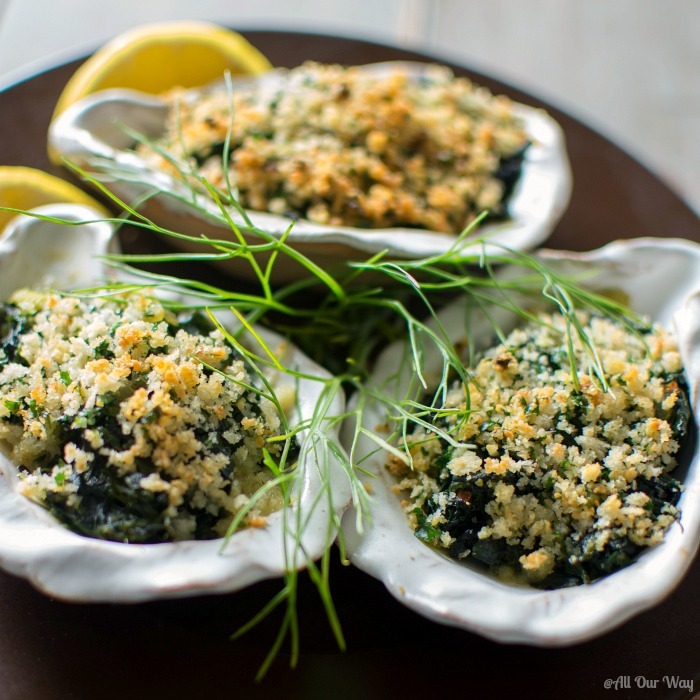 Pop the Oysters Rockefeller in the oven and bake for 10 to 15 minutes until golden. Serve it with lemon wedges and red pepper sauce. The aroma is incredible. Just watch your family and friends gobble up the amazing appetizer. The original Oysters Rockefeller has a sauce, but we believe the appetizer is delicious as is. We hope you try this recipe; even non-oyster lovers will rave about this recipe. If you prefer your oysters fried, then check out our Panko Fried Oyster recipe with the spicy cocktail sauce. Be sure to sign up for our newsletter, we are busy cooking in our kitchen, and we enjoy sharing what we’re doing. A rich elegant oyster appetizer that is easy to make. Oysters are baked in a half shell with a savory spinach blanket and topped with a garlicky Parmesan breadcrumb topping. 1- 9 oz. box frozen chopped spinach thawed. Remove moisture by pressing between paper towels. Melt butter in a skillet. Saute the garlic for 2 minutes to infuse the butter. Place the Panko crumbs and half the Parmesan cheese in a mixing bowl and half the garlic butter, set aside. To the remaining garlic butter in the skillet, add the chopped shallot and celery. Cook until the shallot and celery are soft about 3 minutes. Add the spinach and continued to cook another 3 minutes. Deglaze pan with Sambuca. Season with salt and pepper and add a dash of red pepper sauce. Allow the mixture to cook down for a few minutes. Finish off the bread crumbs by mixing in olive oil, Parmesan cheese, and parsley, season with salt and pepper. Spray the oyster half shell or ceramic shells with oil. Place one oyster with some of its liquor in each shell. Cover each oyster with the spinach mixture. Spoon the bread crumb mixture over the spinach. If using a half shell, sprinkle a baking pan amply with the rock salt. Arrange the oysters in the salt to steady them. If using the ceramic shells, arrange them on a baking pan. Bake in a preheated 450 F. oven for 10 to 15 minutes until the breadcrumbs are golden. Serve with lemon wedges and red pepper sauce. Inspired by the famous Oysters Rockefeller served at Antoine's in New Orleans. Note: Recipes and content from © 2016 All Our Way are copyright protected. Please do not use content or recipe without prior written permission. If you want to share the information, please link to this post. Grazie. What is in the red pepper sauce????? I also love oysters. I love the sambuca in this recipe, and they oysters looks absolutely perfect. I can’t wait to try this! OMG I just love oysters rockefeller. SO decadent and delicious – I am totally craving these now! Mmmm….this dish looks so gourmet! 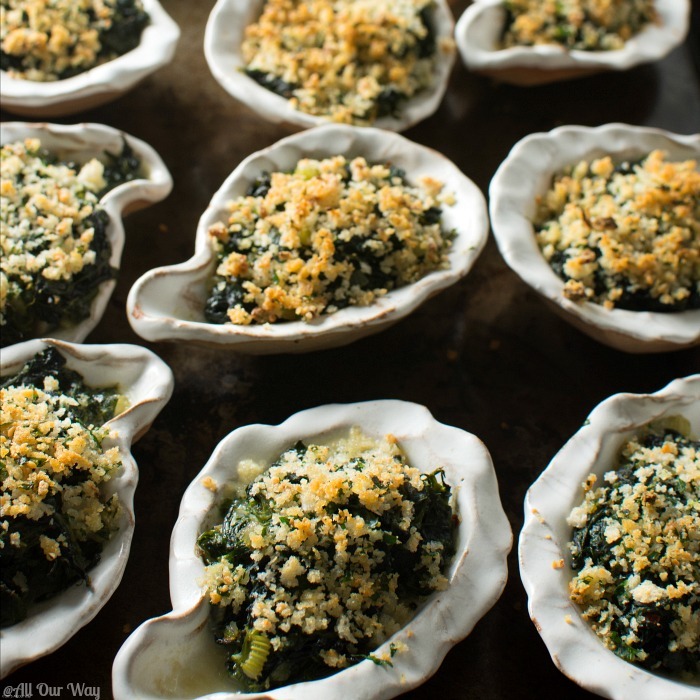 Your oysters Rockefeller recipe is perfect for a Thanksgiving appetizer table. I’ve only had oysters Rockefeller maybe once before, but I remember really enjoying them! Your recipe for them looks so special. This is the perfect special occasion appetizer! This delicious gourmet oyster recipe Marisa. I it is perfect every sense it you can bit into spinach, Parmesan, bacon so yum. Oysters are SO fancy, perfect for special occasions – especially when you make them like this!! I have not eaten oysters in years. When I lived in Singapore there was a restaurant that served the best oysters in town. We often went there to enjoy a good oyster dinner. Oh God, what a beautiful Appetizer. It really impresses me! Very nice presentation. I really like it. These sound like a great appetizer to serve at a dinner party! They look amazing and so elegant! Great idea to replace the shells with ceramic shells! 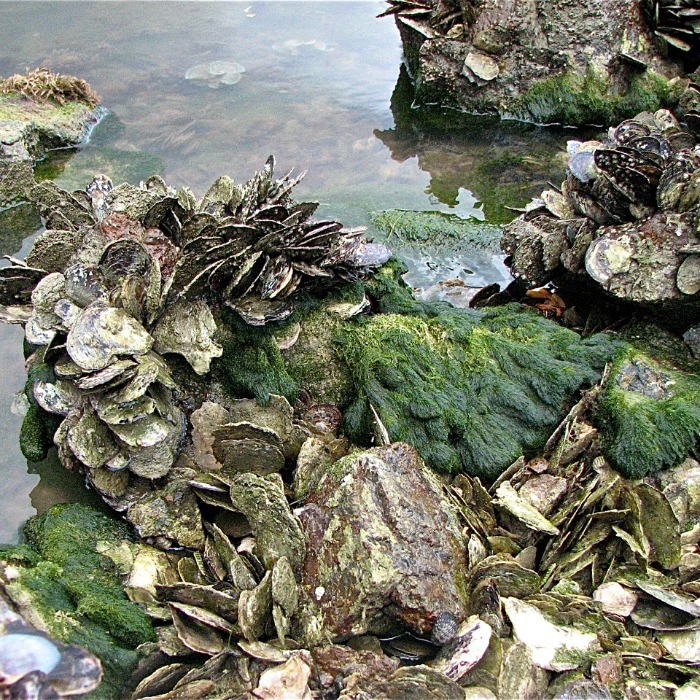 I am sure a lot of great Oysters Rockfellers are yet to be made with those! Great recipe and stunning images! I have never had oysters before. I am so afraid of them it isnt funny raw. BUt these sound like something I could try and not be worried. I love seafood of any kind and I know these look so delicious. I have never seen them like this. Now I am certainly intrigued, they serve them raw here in Florida with signs up everywhere. This is a great appetizer, Melissa! I will definitely give it a try! I’m going to have to try these! They sound delicious! Thank you, Shannon. They are and you can make a quite a few all at once. Hope you had a Happy New Year! Very elegant, Marisa Franca! I’d enjoy this with champagne on New Year’s Eve. Ciao, Frank. We did enjoy them with some bubbly! Hope you had a wonderful New Year. These will be a standout at our New Years celebrations with a good glass of bubbly! Hi, Michele! I’m with you, they’ll make an excellent appetizer with the glass or two 🙂 of bubbly. Merry Christmas and Happy New Year! Ciao, Chiara! Thank you. Do you like oysters? If you don’t like them raw they are wonderful baked. I was too little to have sampled them in Italy — I don’t remember mamma and papà talking about them. Buona domenica, baci. Great Post! We make “Oysters Rockefeller” for all impressive meals. You don’t mention the oyster liquor which must be included in the shell, real or faux. (Would never serve this appetiser in ceramic dishes). The only other difference between your recipe, and the original is the addition of celery and a touch of parsley and the omission of crumbled bacon bits. Not enough difference to call the dish “Italian Style” as it almost the “real” recipe. Great! Hello, Frank. Thank you for the interesting addition to the recipe — I’ll remember to try it your way next time. The last time I ate Oysters Rockefeller out was so very long ago. As I placed the oyster on the shell there was oyster liquor on it. I’ll have to add that to the recipe. We are able to obtain fresh Gulf oysters periodically. 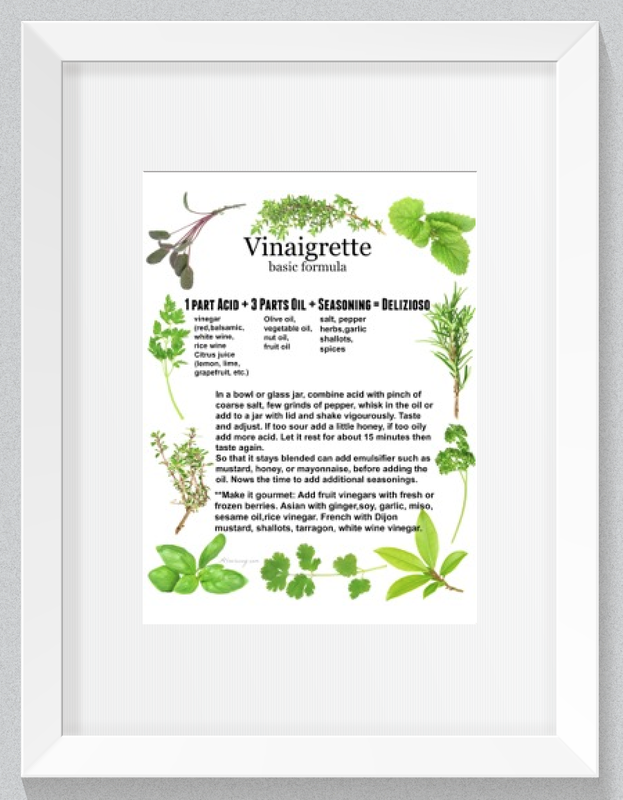 One of the reasons I did call it Italian was the Sambuca, which we already had, and the Italian parsley plus celery. Since we do like the anise taste, we’ll have to check out the Pernod at the liquor store. Again thank you for your great addition to the recipe. Hope you have a very Merry Christmas and a Happy New Year. I am a purist and so it is difficult to think of eating oysters any other way than on the half shellwith a dash of tabasco and a bit of lemon. However, your recipe for Oysters Rockefeller is enough to make me a convert. Hello, Lisa! We also like our raw oysters but every now and then we love having Oysters Rockefeller as a treat. They are really good!! Let me know if you try them. Can I admit this Ky girl has never had oysters?? This sounds so good! I love your stories behind how it was created and how you discovered it ❤️❤️. I’ve never even thought about trying oysters but now my mouth is watering. I’m going to the big city today…maybe I’ll get some to cook up while I’m there! You guys have a very Merry Christmas! Hi, Elizabeth! Let me know what you do with the oysters. I bet you’d love them fried — YUM! And Oysters Rockefeller are delicious. Have a great weekend and stay warm!! Merry Christmas to you and your family. Lovely post and I love the background on how you came to enjoy this seafood. Thank you, Jovina. I hope your weather is warmer than ours. Brrrr! Have a great weekend.